Today at Fenway Park, the Red Sox decided to put that otherwise lame pink merchandise to good use: raising breast cancer awareness. The most adorable team spokesman? Hands down, without a doubt, D’Angelo Ortiz. 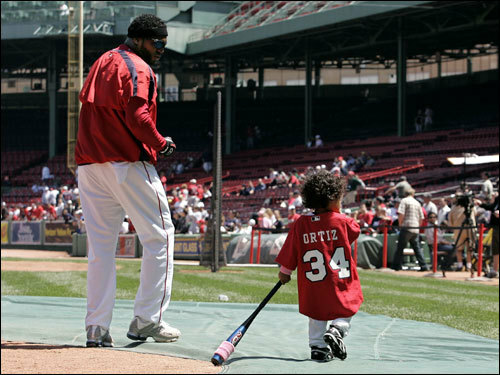 Or, as I like to think of him, Li’l Papi. I am so sick of Clemens! If you are going to retire, then bloody retire already! And if you are going to pitch, have the respect for the game and the players to show up at spring training and work out with the team like almost everyone else does. Don’t say “Oh, you know, I’ll just see who I think will be the best contender for the title” and then go with them. Of course, he says he wants to go with the best contender. The Sox are in first place by a good margin. The Yanks are in last. Who does he go with? The Yanks. Guess his “I’ll go with the best team” turned into “I’ll go with the team with the best offer”. I’m sure he’ll be good, but I really hope he chokes big this year! And maybe he’ll FINALLY retire!